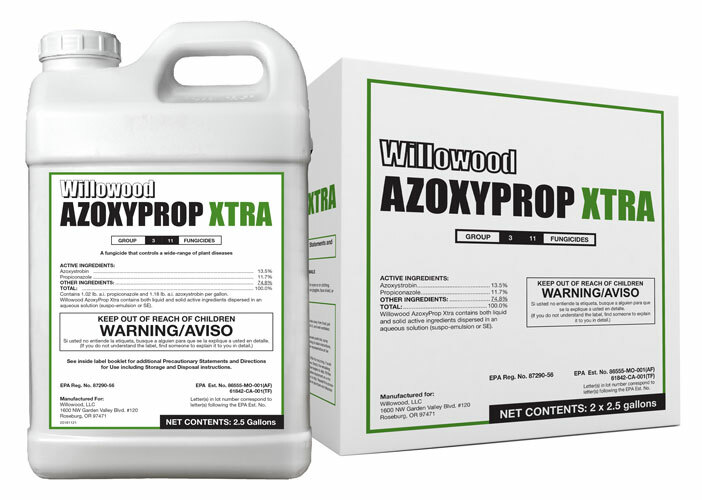 Willowood AzoxyProp Xtra is a broad-spectrum, multiple mode-of action, preventative fungicide with systemic and curative properties recommended for the control of many important plant diseases. Willowood AzoxyProp Xtra may be applied as a foliar spray in alternating spray programs or in tank mixes with other crop protection products. For specific use instructions see back or refer to Willowood AzoxyProp Xtra product label. Contains 1.02 lb. a.i. propiconazole and 1.18 lb. a.i. azoxystrobin per gallon. Willowood AzoxyProp Xtra is a suspo-emulsion formulation. QUILT XCEL® is a registered trademark of Syngenta Group Company.